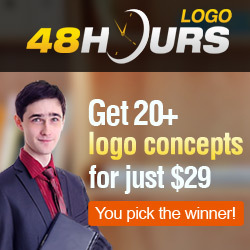 48 Hours Logo is an online website that delivers logos and logo design service. 48HoursLogo.com is one such website which deals in the crowd sourcing of Logos and provides logo design services. This company was founded by Mr. Chris in the year 2010 and it has its headquarters in Shanghai, China. Mr. Chris is a holder of a Bachelors and MS Degree in Electric Engineering. Read on to know more about 48 hours logo. Crowdsourcing is a form outsourcing done which has been trending up since couple of years. The concept is based on the idea that you get works from one set of people and you outsource those works to another set of people. The works are outsourced to the talented experts in that particular field of work. On the other hand the people to whom the work is outsourced can easily earn few bucks using their talent and skills. 48 hours logo has a wonderful pool of freelance logo designers who are highly talented in this area. Each designer has a unique style of crowdsourcing their designs. It provides services to around 15,000 small business owners and entrepreneurs now. Select what you like to design? – First you must decide upon whether you want to get designs for a Logo or Web Designs or Print Designs and you must select the from the option. Name of the Business – Type in the name of your business or organisation. About the Business – Give the details on the nature and kind of your business you are dealing with. Target Audience – You must specify for whom is your product intended for. You need to select an industry here like Education, Entertainment, Financial and Insurance, Manufacturing and Wholesale, Media, Medical and Dental, Natural Resources, Religious, Restaurant, Retail, Service Industries, Sports and Recreation and so on. Select Logo Styles – The different logo styles like Abstract, Symbol, Typography, Illustration, Corporate, Fun, Web 2.0, Initial. etc. are available and you can select up to three different options you want your designers to explore on. Any particular colors in mind? – You can select three colors you want the whole theme to be based upon. If you are not too concerned about the colors you do not need to fill this column. Ideas and Concepts – If you have anything particular in mind in terms of font, style and so on, you can mention it here. If you have a sample picture of it, you can also upload that. Set your contest prize – You have to set the price for the winner you are ready to offer. The minimum price is $89, the higher the price you put the more you will attract the designers. 48HoursLogo.com Fee – 48 hours logo charges a fee of 10% for listing and carrying out your contest. Private Contest – This is an additional option available where on by upgrading with $30 you can make your project visible only to the logo design engineers from 48Hoursogo.com and hide it from the public, search engines and other competitors. Featured Contest – The option of featuring your contest helps you to receive more participation from the designers. If you upgrade by paying $19 your project will appear in the Featured Contest set which is listed above the regular projects and your project will get maximum designer exposure. Participation Pay – Not only for the winner but if you can pay the participants too. In this way your project will attract more designers and you will get more quality designs. The participation pay is charged at $5 for each participant. Matching Stationery Design – Along with the logo if you want to have business cards or letterheads or envelope with your new logo, you can select this option. You don’t have to worry about all your participants preparing for the same. Once you select the right logo you can furnish your details to the winner later. List contest with initial payment – This is an economical scheme where you just have to pay $29 to start with the quick logo contest for 48 hours. Only after you have seen the designs and satisfied with the concepts submitted by the designers you need to make the rest of the payment. Prepay contest in full – This option attract more number of logo designers as opting this method indicates that you will be certainly purchasing the logo design. The contest duration can also be set by you, say between 1 and 7 days. You can type in the number of days you want to run the contest in the option given below this. Your pay rate will definitely be more than $89 here. STEP 2: Here you will get a number of designs from various designers within 48 hours. Give your feedback directly on the designs. In this way you can guide your designers to the right path. If you are not interested in any particular design eliminate it. Rate each designs between 1 and 5 stars. Based on these ratings the designers can make out your preferences, taste, specifications, any alterations and so on from this evaluation. STEP 3: This is the final stage where you pick the winner and reward them. And if you are interested in the webpages or print designs you can allot that work here. Logo Design – You can get logo designs for your product or service or website. Stationery Design – Along with creating logos if you want business cards or pamphlets or the similar you can get it done using the same theme. Icon/Button Design – Designed for the icons and buttons in your website or applications are developed here. b. Mobile App Design – Various Mobile application designs are available upon your request. You can also get the mobile version of your website designed, its logos and themes. c. Web Banner Design – The banners you usually see in websites for advertising your product is the Web Banner. Your web banners can be designed in any form you like, even in the form of marquee. There are web banners designed for the top of the page, the bottom and both the sides too. T-shirt/Flyer Design – You can even get a T-shirt or Flyer designed by the designers of your logo. Brochure Design – The brochures using the same logo and theme or even customized ones are designed by them. Packaging Design – The stickers to be stuck onto the product, the package material, the wrapping material and so on are designed too. Qualifying Stage – This is the stage where you get the various numbers of designs from the various designers. Select Finalists – Based on the theme you provided and on quality you select free logos from the various logo designs received. Design Revisions – The finalists are then evaluated based on various criteria. Winner Selected – Finally a winner is selected who get the prize you offered. Why is 48 hours logo preferred? Cost effective – 48 hours logo gives the desired results in the most affordable prices. It is cheaper compared to its competitor, 99Designs. Quality – High quality services are provides as your needs are attended by the best team of designers. Customisation – You can get access to a number of custom designed logos. Time effective – You can get your logo done even in few hours. You can set your deadlines too. 100% full legal ownership – The biggest advantage is that you can get 100% full legal ownership of your new logo design. 48 hours logo is not only easy to use and but very intuitive too. You can get the best value for the logo design starting at just $29. On the other hand, it is a great technique for talented designer to sell their talent online and make money. You will get amazing results from the large pool of talented designers who produces industry standard vector logo design and these can be used in any applications. Thus, making 48 Hours Logo always the first choice in getting the desired logo design. Contest Discussions – this gives the advantage of having direct discussion under each design and also you have a separate section for having your general discussions. You can also upload any additional files in it. Inviting Designers – if you are a regular customer you will have certain designers. So there is an option of inviting the designers. You can go to the profile of the designers and send them a message and invite them. You can only invite up to three designers. 48 Hours Logo provides logo design services to around 15,000 small business owners and entrepreneurs. I just put in a request for my small business set up, and my request was processed, as per my requirement. Thank you 48 Hours Logo. Even though they advertise with you have to spend only $29 to get your logo designed there are certain hidden costs involved in it. The total amount can come up to $114 also. If you increase your price money naturally you will get more contestants. The payment mode used here is by using PayPal.